Mike Tyson said that, well something like that. It’s true for a lot of things and it’s especially true for the job search. I’m sure I can get a job in a month, it won’t be a problem. I’m just not going to think about it right now. Yeah, I’m not too worried about it. I’ll start dropping my resume here and there in a few weeks. I’ll land something soon, I have a lot of friends at companies. But the reality is, the job search always takes longer than you expect and it’s a roller coaster of emotions. My job search was no exception. I started to earnestly try to get a job at a brand name tech company in early 2013, probably around February. As I’ve written about before, at first, I was going after roles I was not qualified for and getting rejected for every role. Read more about that here: How I finally got interviews at Palantir and Dropbox. It was demoralizing to get so many rejections. I had mentally pumped myself up and gathered enough courage to start putting myself out there, only to get rejected by every job I applied to. However, I realized I was applying to the wrong roles and once I started to go after roles that I was qualified for, I started to get interviews! I changed my mindset once I was in the interview process with Dropbox. Dropbox was my dream company during my job search. I loved the product, (I was even a paying user! ), I loved the future potential of the company, and I wanted to be part of the journey. But after having gone through months of continual rejection, I knew I had to get my mindset right to put my best forward and if for nothing else, self-preservation. Here are the 5 things I kept reminding myself. 1. It’s going to take longer than you think. I started my tech job search in February of 2013. I got my job offer from Dropbox in August of 2013. It took a solid 6–7 months to find the right job for me. It takes time to figure out where to apply, how to get connected, actually interview, and then get an offer. And of course, along the way, you’ll get rejected and have to start the process all over again with another company. When I was interviewing at Dropbox, as best I could, I tried to stay patient and made up my mind that the process was going to take a while. I had no expectations I would get a job offer within a few weeks. I ‘d learned from previous interview experiences that just scheduling interviews can take a long time. It also takes even more time for the company to debrief, they’re often interviewing a handful of other candidates for the same role at the same time. 2. Don’t go in an isolation job search bunker. Sometimes, when the job search is stagnating, you’re tempted to infuse life into it by making up your mind that your sole focus in life is going to be your job search. I’m going to grind it out and spend 100% of my time finding a job. No distractions. This mindset never works. It leads to burn out and eventually despair. Yes, you do need to devote time, energy, and focus to land a good job. And usually, a lot of all of those things are required. However, the job search in general is stressful enough. Don’t make it worse on yourself by not taking care of yourself physically, mentally, and spiritually. Do what you need to do to recharge your energy. Hang out with friends, go out in nature, or keep up with your hobby. I’ll get off my soapbox on this, but remember to take care of yourself first so that you can be the best version of yourself during your job search. 3. If you’re not getting rejected, you’re not aiming high enough. If you’re getting every interview call back and receiving an offer for every job, that may sound great, but that probably means you’re selling yourself short. There is a difference between being delusional and aiming high. If you’re getting rejected 100% of the time and not even getting interviews, you’re being delusional about the roles you’re going after. If you’re getting rejected 50% of the time, that’s a pretty good rule of thumb that you’re aiming high. A mix of rejection and success is the best way to learn where to make adjustments and improve in the job search. I kept reminding myself of this as I was getting both positive and negative responses. Having learned from both interview successes and failures, I felt confident approaching my Dropbox interviews. 4. Hedge your bets, make sure you’re interviewing at other places for leverage. Remember that the job market is first and foremost, a market. You’re looking for a job and companies are looking to fill jobs. Make sure you’re actively interviewing at multiple companies, this gives you the most leverage as a job applicant. Let companies know you are interviewing at other places, it’ll keep them engaged, they don’t want to lose a good candidate to a competitor. If you get a job offer, let every other company you’re interviewing with know. This will speed things up and you are now in the driver’s seat. A job offer is the single best market indicator that you are a desirable candidate. This signals to the other companies that you have been de-risked as a candidate, their competitor has already marked you as qualified, it’s worth the time and money to speed up your interview process. 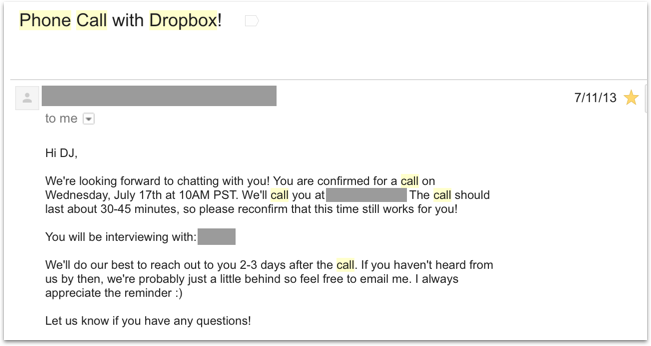 When I told other companies I was interviewing with that I had an offer from Dropbox, I was immediately fast-tracked to on-site interviews. 5. Where you are now is not where you’re going to be. This is a mantra I’ve kept repeating to myself over the last few years. It’s a reminder and commitment to myself that I will always continue to learn and grow. Even if I’m not in the exact role I’d like to be in right now, I’m going to make the most of the opportunities in front of me to gain the experiences and skills to get to where I want to be. This mindset is especially important if the job search has gotten you down. There are times where the job search feels like it will never end and you feel like you’ll forever be stuck. We’ve all been there. During those times, take a step back. Reach out for help from someone you trust to help you reorient your job search, or just reach out to a friend who will let you vent. But keep telling yourself, where you are now is not where you’re going to be. Even amidst all the rejections, you’re moving forward.